Great new paper with a nice approach to detecting epistasis. Various methods have been developed for identifying gene-gene interactions in genome-wide association studies (GWAS). However, most methods focus on individual markers as the testing unit, and the large number of such tests drastically erodes statistical power. In this study, we propose novel interaction tests of quantitative traits that are gene-based and that confer advantage in both statistical power and biological interpretation. The framework of gene-based gene-gene interaction (GGG) tests combine marker-based interaction tests between all pairs of markers in two genes to produce a gene-level test for interaction between the two. The tests are based on an analytical formula we derive for the correlation between marker-based interaction tests due to linkage disequilibrium. We propose four GGG tests that extend the following value combining methods: minimum value, extended Simes procedure, truncated tail strength, and truncated value product. 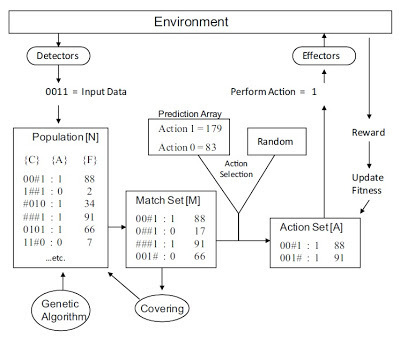 Extensive simulations point to correct type I error rates of all tests and show that the two truncated tests are more powerful than the other tests in cases of markers involved in the underlying interaction not being directly genotyped and in cases of multiple underlying interactions. We applied our tests to pairs of genes that exhibit a protein-protein interaction to test for gene-level interactions underlying lipid levels using genotype data from the Atherosclerosis Risk in Communities study. We identified five novel interactions that are not evident from marker-based interaction testing and successfully replicated one of these interactions, between and , in an independent sample from the Multi-Ethnic Study of Atherosclerosis. We conclude that our GGG tests show improved power to identify gene-level interactions in existing, as well as emerging, association studies. This open-access paper reports our successful application of learning classifier systems (LCS) to the genetic analysis of bladder cancer. This method is promising because it can detect both epistasis and genetic or locus heterogeneity. First read our comprehensive review of LCS. We also have a more recent overview of our own LCS approach in Computational Intelligence Magazine. BACKGROUND AND OBJECTIVE: Detecting complex patterns of association between genetic or environmental risk factors and disease risk has become an important target for epidemiological research. In particular, strategies that provide multifactor interactions or heterogeneous patterns of association can offer new insights into association studies for which traditional analytic tools have had limited success. 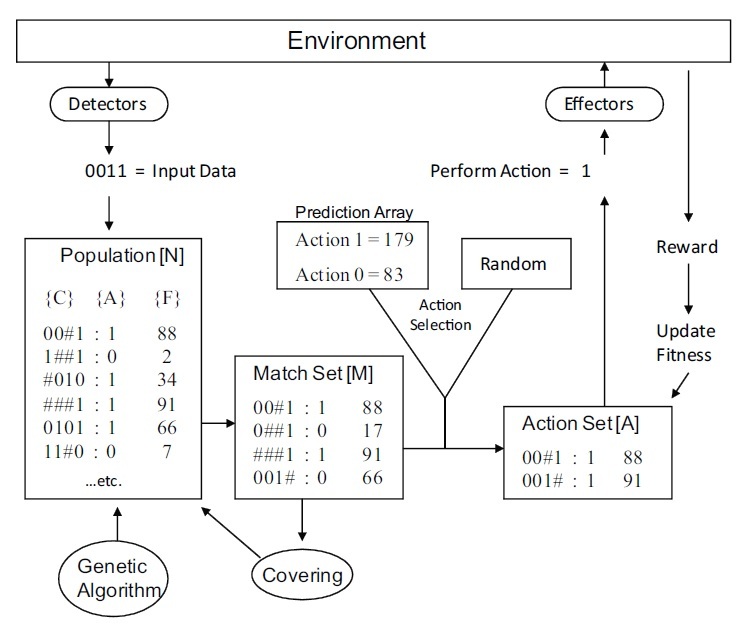 MATERIALS AND METHODS: To concurrently examine these phenomena, previous work has successfully considered the application of learning classifier systems (LCSs), a flexible class of evolutionary algorithms that distributes learned associations over a population of rules. Subsequent work dealt with the inherent problems of knowledge discovery and interpretation within these algorithms, allowing for the characterization of heterogeneous patterns of association. Whereas these previous advancements were evaluated using complex simulation studies, this study applied these collective works to a 'real-world' genetic epidemiology study of bladder cancer susceptibility. RESULTS AND DISCUSSION: We replicated the identification of previously characterized factors that modify bladder cancer risk-namely, single nucleotide polymorphisms from a DNA repair gene, and smoking. Furthermore, we identified potentially heterogeneous groups of subjects characterized by distinct patterns of association. Cox proportional hazard models comparing clinical outcome variables between the cases of the two largest groups yielded a significant, meaningful difference in survival time in years (survivorship). A marginally significant difference in recurrence time was also noted. These results support the hypothesis that an LCS approach can offer greater insight into complex patterns of association. CONCLUSIONS: This methodology appears to be well suited to the dissection of disease heterogeneity, a key component in the advancement of personalized medicine. In this brief paper we show evidence for three-way epistatic interaction among SNPs from several excellent candidates for tuberculosis. This highlights an example of how three-way interactions can be detected and characterized in genetic association data. BACKGROUND: Identifying high-order genetics associations with non-additive (i.e. epistatic) effects in population-based studies of common human diseases is a computational challenge. Multifactor dimensionality reduction (MDR) is a machine learning method that was designed specifically for this problem. The goal of the present study was to apply MDR to mining high-order epistatic interactions in a population-based genetic study of tuberculosis (TB). RESULTS: The study used a previously published data set consisting of 19 candidate single-nucleotide polymorphisms (SNPs) in 321 pulmonary TB cases and 347 healthy controls from Guniea-Bissau in Africa. The ReliefF algorithm was applied first to generate a smaller set of the five most informative SNPs. MDR with 10-fold cross-validation was then applied to look at all possible combinations of two, three, four and five SNPs. The MDR model with the best testing accuracy (TA) consisted of SNPs rs2305619, rs187084, and rs11465421 (TA = 0.588) in PTX3, TLR9 and DC-sign, respectively. A general 1000-fold permutation test of the null hypothesis of no association confirmed the statistical significance of the model (p = 0.008). An additional 1000-fold permutation test designed specifically to test the linear null hypothesis that the association effects are only additive confirmed the presence of non-additive (i.e. nonlinear) or epistatic effects (p = 0.013). An independent information-gain measure corroborated these results with a third-order epistatic interaction that was stronger than any lower-order associations. CONCLUSIONS: We have identified statistically significant evidence for a three-way epistatic interaction that is associated with susceptibility to TB. This interaction is stronger than any previously described one-way or two-way associations. This study highlights the importance of using machine learning methods that are designed to embrace, rather than ignore, the complexity of common diseases such as TB. We recommend future studies of the genetic of TB take into account the possibility that high-order epistatic interactions might play an important role in disease susceptibility. This is a short paper describing our new ViSEN software. This builds on work from the previous few posts on detecting three-way epistasis. Our ViSEN software package is freely available from sourceforge. The nonlinear interaction effect among multiple genetic factors, i.e. epistasis, has been recognized as a key component in understanding the underlying genetic basis of complex human diseases and phenotypic traits. Due to the statistical and computational complexity, most epistasis studies are limited to interactions with an order of two. We developed ViSEN to analyze and visualize epistatic interactions of both two-way and three-way. ViSEN not only identifies strong interactions among pairs or trios of genetic attributes, but also provides a global interaction map that shows neighborhood and clustering structures. This visualized information could be very helpful to infer the underlying genetic architecture of complex diseases and to generate plausible hypotheses for further biological validations. ViSEN is implemented in Java and freely available at https://sourceforge.net/projects/visen/. 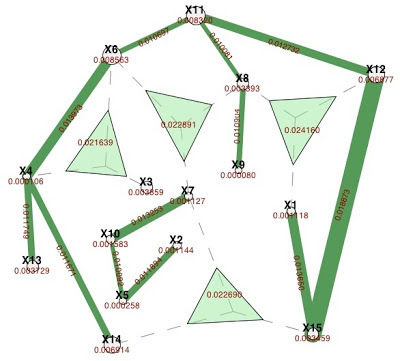 In this paper we show how building a network based on pairwise epistatic relationships can reduce the computational complexity of search for three-locus interactions. This was presented by my postdoc, Ting Hu, at the 2013 Pacific Symposium on Biocomputing. The rapid development of sequencing technologies makes thousands to millions of genetic attributes available for testing associations with various biological traits. Searching this enormous high-dimensional data space imposes a great computational challenge in genome-wide association studies. We introduce a network-based approach to supervise the search for three-locus models of disease susceptibility. Such statistical epistasis networks (SEN) are built using strong pairwise epistatic interactions and provide a global interaction map to search for higher-order interactions by prioritizing genetic attributes clustered together in the networks. Applying this approach to a population-based bladder cancer dataset, we found a high susceptibility three-way model of genetic variations in DNA repair and immune regulation pathways, which holds great potential for studying the etiology of bladder cancer with further biological validations. We demonstrate that our SEN-supervised search is able to find a small subset of three-locus models with significantly high associations at a substantially reduced computational cost. We present in this paper a new method for estimating three-way epistatic interactions in genetic association studies. BACKGROUND: Epistasis has been historically used to describe the phenomenon that the effect of a given gene on a phenotype can be dependent on one or more other genes, and is an essential element for understanding the association between genetic and phenotypic variations. Quantifying epistasis of orders higher than two is very challenging due to both the computational complexity of enumerating all possible combinations in genome-wide data and the lack of efficient and effective methodologies. OBJECTIVES: In this study, we propose a fast, non-parametric, and model-free measure for three-way epistasis. METHODS: Such a measure is based on information gain, and is able to separate all lower order effects from pure three-way epistasis. RESULTS: Our method was verified on synthetic data and applied to real data from a candidate-gene study of tuberculosis in a West African population. In the tuberculosis data, we found a statistically significant pure three-way epistatic interaction effect that was stronger than any lower-order associations. CONCLUSION: Our study provides a methodological basis for detecting and characterizing high-order gene-gene interactions in genetic association studies.